Angus McKinnon, was born in Paisley on 6 December 1885. His Arsenal career covered the period 1908 to 1922 and included 217 appearances for the club and four goals . He played with the junior league team Petershill in the north of Glasgow who had been formed when Angus was two years old, and who became one of the strongest clubs at this level. They now play in the West Region of the Scottish Junior Football Association. There are suggestions Angus signed for Heart of Midlothian (although some references omit this) and then Carlisle United in the Lancashire Combination before going to Woolwich Arsenal in May 1908, playing his first match on 12 December that year in a defeat to Bradford City. He became a regular for the club, living through the move to Highbury, the relegation and the promotion. During the war he served as a driver in the Royal Field Artillery, and returned to aged 32 in 1919, and was only finally replaced in 1921/22 by Tom Whittaker as left half. In 1922 he signed for Charlton Athletic on a free transfer, and then in 1923 joined Wigan Borough who were then under the managership of former Woolwich Arsenal player Charlie Bell, but it is not clear that he played for Borough who were at this time a Third Division North team. Angus then (in 1923, I think) went to New Brighton where he stayed for 27 years as trainer and coach. New Brighton A.F.C. had been formed in 1921 as a replacement for South Liverpool and entered Third Division North in 1923 – the moment I believe Angus joined them. The club reached the 4th round of the FA Cup in 1928 (losing to Port Vale) in 1938 (losing to Tottenham after a replay – (Angus must have loved that), and in 1957 season. By this time they were a non-League club, and beat three League clubs before losing to Burnley. The club were voted out of the Third Division North in 1951, and moved into the Lancashire Combination. Angus retired in 1962 and died in 1968 aged 81. New Brighton struggled on until 1983 but a series of relegations and battles with Inland Revenue finally finished them. A new club bearing the same name was formed in 1993. Here’s the team for the final Arsenal game at Plumstead, with links to the players covered so far. 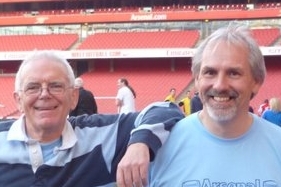 Footnote: Angus’ brother makes an appearance in “Making the Arsenal” – but this character is wholly fictitious, and was introduced simply to help get Jacko Jones into the shareholders’ meeting. More Arsenal History: including newly discovered revelations about Herbert Chapman. Angus McKinnon was my Grandfather and the correct DOB is December 6, 1885. Suzanne,do you have any photographs of your grandfather? I am researching Arsenal players who served in The First World War and am working at accumulating an archive for the future interests of fans of the Club.